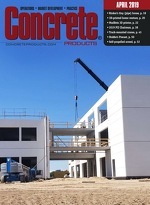 MMC Materials, Inc. and sister company Bayou Concrete, LLC, are the latest ready mixed concrete producers to join the Preferred Producer distribution network of CeraTech USA, an Alexandria, Va., developer of a fly ash-based binder formulated to match portland cement alternatives. As Mississippi’s largest ready mixed concrete producer, MMC & Bayou’s customer commitment includes identifying and offering technologies that enhance value to the construction marketplace and with the CeraTech agreement affording a full range of bulk cements for specialty concrete applications. “Being able to offer a product like CeraTech Cement supports our leadership in the marketplace by providing our customers a durable and sustainable material meeting their demanding concrete applications,” says MMC President Rodney Grogan. NOAHH’s mission is to mobilize volunteers and local organizations to provide safe and affordable homes to families. Donations and volunteer efforts from community stakeholders enable Habitat for Humanity to serve over four million people worldwide. Lafarge U.S. donates time and materials to Habitat for Humanity organizations across the country.